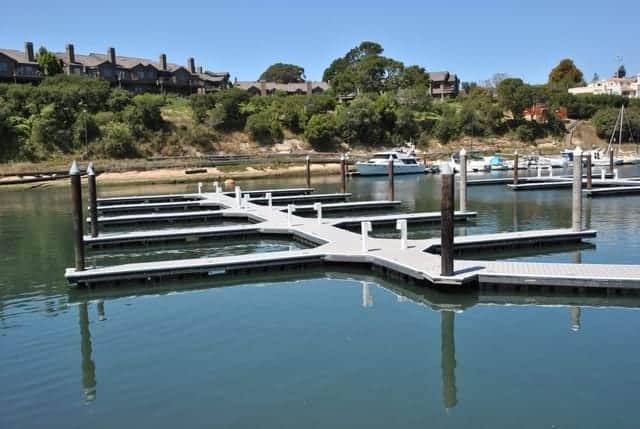 The Indian Creek Yacht & Country Club, founded in 1955, has grown in membership and footprint over the past 60 years. The club has gone through many renovations, including an outdoor dining area where guests can enjoy the views of the Chesapeake Bay area, which was constructed using plastic lumber. This project is a great example of how using plastic lumber can drive profitability and serve as a long-term structural product. Indian Creek Yacht & Country Club, in Kilmarnock, VA, is a member-owned private club that offers first class recreational, social and dining experiences and many amenities including tennis, golf, boating and pickleball. The club has over 6,000 yards of golf course and year-round dining and social opportunities. The club wanted to add an outdoor dining area for members and guests to enjoy. They also wanted more space available for larger parties and special occasions. As the project got underway, architects chose to design and build a pergola for this outdoor dining area. After a lot of online research to find alternatives to traditional timber, the architects came across a product called HDPE composite lumber. This product sparked their interest because it had more long-term benefits than using traditional wood, such as low life-cycle cost, durability in harsh environments and low-maintenance. Another challenge was the pergola was designed to be white and enhance to look of the outdoor dining area, while providing shade and shelter for the guests. It was important to be able to easily maintain the bright white look without a lot of extra effort. The product itself also needed some structural integrity as it would need to cover the entire outdoor dining area and withstand rain, snow and high winds. The next step was to make sure this material would fit the project’s structural and aesthetic requirements, and to find the right manufacturer that could offer a great product at a fair price, and provide excellent customer service to ensure that the project went smoothly. The architects partnered with the Norman Company, a family-owned and operated general contractor, to find the right HDPE composite plastic lumber. 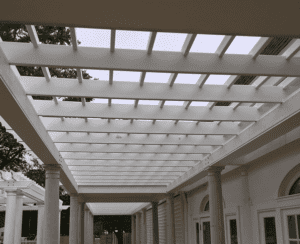 Due to the functionality of Beautthe pergola, the material needed to be structural grade, have a reasonable cost, be easy to maintain, and easy to clean. Aesthetics were also important for the overall look of the pergola. With the help from Bedford Technology’s in-house engineering team for design, installation and overall product information, the Norman Company chose FiberForce® by Bedford Technology. A beautiful pergola was built and completed in 2017. During the installation, there was a small site set-back that delayed the timing of the project. 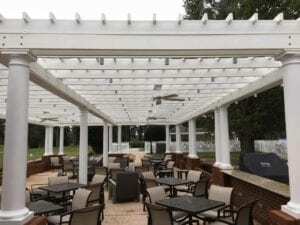 With Bedford Technology’s sales, engineering, and customer service team closely involved, they were able to assist team in a quick turnaround and get the pergola completed in the fall of 2017. In the short time that the pergola has been installed, it has seen a lot of environmental variations: 60MPH winds that flipped over trucks, extreme heat to extreme cold temperatures, and it still looks brand new.